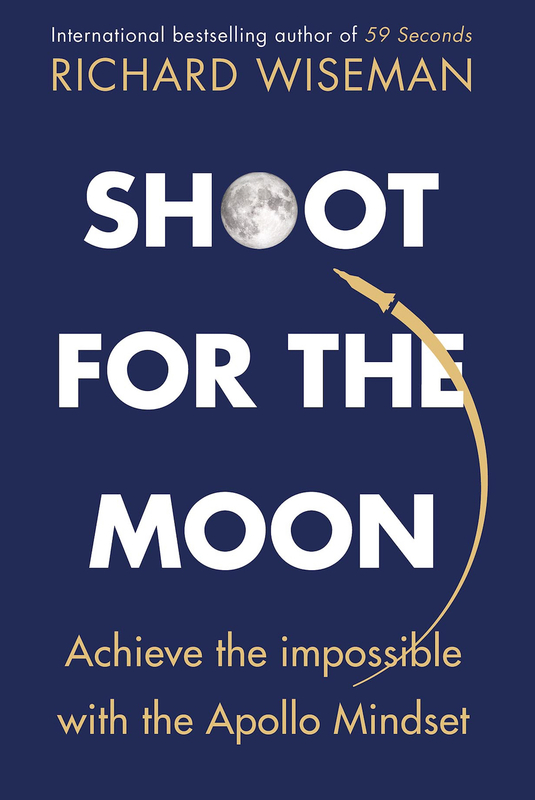 Join in with the battle of clever stuff! Last week I staged another battle of the clever stuff, and put a nice illusion photograph against an optical illusion. The optical illusion won by a narrow margin. So, it stays on, and this week it is up against a wonderful poster. 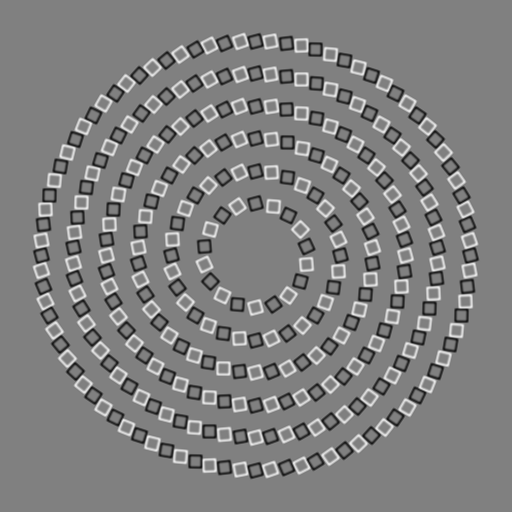 Have a look at them both….here is the illusion again (the squares make complete circles)…. This, of course, is a modern version of the ‘what can you see in the image below’ illusion…. So, which wins?Illusion or poster? Vote now and feel free to justify your choice below…. If the blood puddle were actually shaped like something else, it would be cooler. I went for the optical illusion. Is it a woman with open mouth in the vampire poster? I prefer the vampire one. The vampire poster is two profiles, one at the top and the bottom one with biting the upper one’s neck. Guess it’s not that good if people can’t see it. Now that you explained the bottom profile, I can see it. This is a neat illusion. It’s just challenging. What are we supposed to see in the very bottom picture? Looks to me like part of a disfigured face, but if that’s what it’s supposed to be it’s a bit crap. it is a cow, but i couldn’t figure out what the hell it was util I put my cursor over it and it said ‘cow420’ or something to that effect. Then I saw it right away. Wow the vampire one is amazing, took me quite a while to see it. But that is awesome, i kept seeing a profile in the top right which is wrong, eventually i saw it though. Two profiles, one about to bite the other ones neck. Aha! The very bottom one is a cow! Moo! is there a caw in the bottom picture? The optical illusion looks like a spiral going down towards the middle. But it is not actually a spiral. 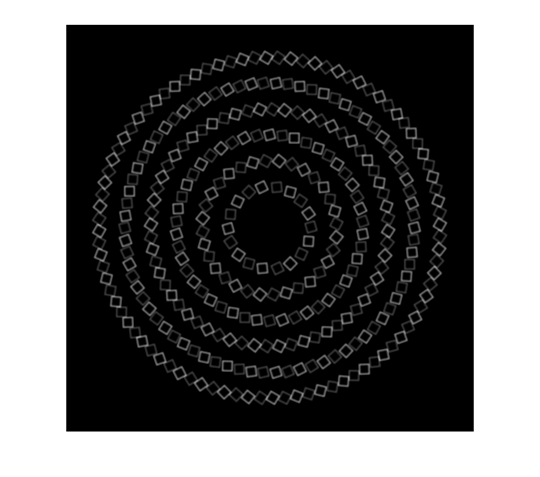 Run your finger along the “path” of the circles and you will see that they are four perfect circles, none of them are spiral shaped, none of them join up and none of them cross the other circles, but the impression is that it somehow is a spiral. The Poster is good but the Optical illusion is better. I voted for the vampire poster. It took me a little while to see it but when it appeared I thought Wow! that’s brilliant. I can see a cow in the bottom picture. Chose the optical illusion – so effective. In the bottom image, I first saw a strange-looking face with stitches on one cheek, then saw a hybrid cow/pig. is there really something on the last image ? Or is it just a trap to make us imagine ‘things’ from a strange image ? Is it a kind of Rorschach test ? I remember seeing the bottom picture in a psych class in college. It’s meant to show you that if you don’t know what it is your brain looks at it a lot of different ways trying to figure it out. Then when you are shown, and know what it is you can’t see it in any other way than what the picture is actually showing. the picture above is of a cow looking at you. Large black spot on the left side is an ear, just bellow that to the right is an eye. Going straight to the right is the other eye and ear with the nose at the bottom between the two. Thank you for that; I wouldn’t have been able to find the cow without that. I saw the cow’s neck as teeth, and was trying to find a face from there. Like qbsmd, even after learning there was a cow in the picture, I couldn’t see it until your description. Thank you! I love the visual images and not so much the optical illusion. I’ve always liked visually arresting images and it amazes me how long it takes me to see the images. Over a minute for each. The Vampire poster popped into my brain suddenly and the cow slowly faded in. The brain is such an interesting thing. Yeah, I never would have found the cow without you describing it, Garret. I vote poster, just to keep things changing. Also, it’s artistic whereas the illusion is really just math. Not that there’s anything wrong with math. Surely the whole point of an optical illusion is that it isn’t “just math”? I voted for the optical illusion (again). Can you put something in there that beats it please?! Also, am i the only one who saw a deer’s face in the B&W picture? Now that you mention it I think I can see a deer peering from behind something – with the black mark on the ‘cow’s’ face being the deer’s nose. I couldn’t ‘get’ the third image until I saw the filename, and then it was obvious. The poster is clever, but I agree with the other comments, you can still see it both ways after seeing the hidden image. The circles of squares still make my brain hurt. teh vampire poster is pretty neat – biting a neck fits in very well with the vampire theme! 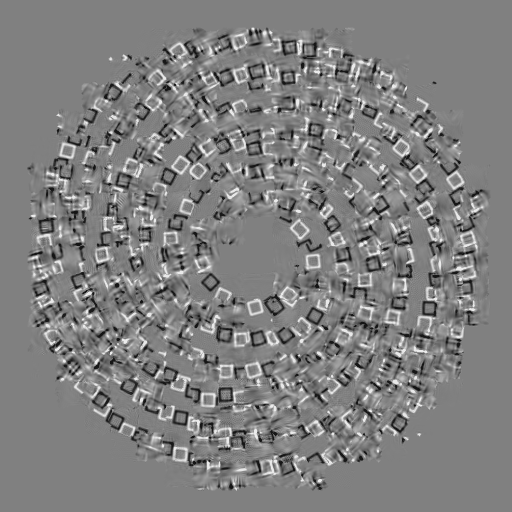 but i rather liked the optical illusion – yes the squares do make full circles if u look closely. The optical illusion is clever, but I liked the vampire one better. I didn’t see a cow until I read the comments. I saw a skull, Stalin’s moustache, smoke, and winter trees. I only saw the two people in the vampire picture, it wasn’t hard at all, and the circles make my head hurt. I can see 3 different images in the vampire poster: 1) an archipelago, 2) dripping blood 3) human and vampire. If I concentrate, I can shift my perspective to see the one I want. …but I like the top one better. I couldn’t see anything BUT the vampire and the prey in the True Blood picture though I assumed I was supposed to see a pool of blood as well. Took a while and then I saw that. Sort of. 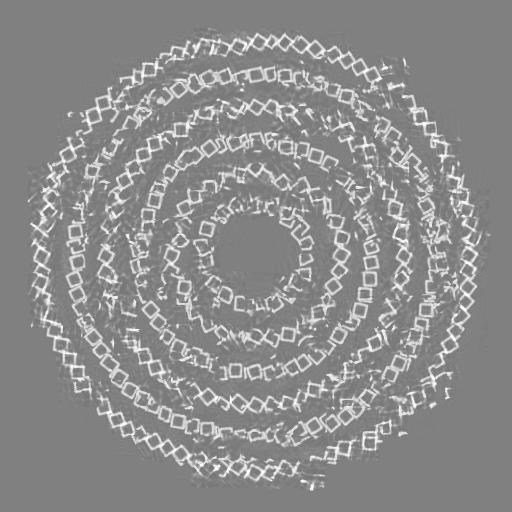 I love the spirals, that illusion hurts my eyes to look at but if you follow the circles with your mouse you can straighten it out a bit. I was introduced to the cow picture in a human-computer interaction class, in a lecture to demonstrate how just because something is clear to you (because you understand it) doesn’t mean it’s clear to anyone else. I still see the cow and can’t un-see it. Thanks. Dr. Ogden! The vampire poster wins hands down. I couldn’t see ANYTHING in the optical illusion ’til I followed Garrett’s instructions to start at the left ear. Thanks Garrett for saving my sanity! Pingback: Put Your Illusion to Use, Part 1 « Is It Luck? It took me forever to see the vampires, but I’m also viewing it on a little screen which probably doen’t help. I saw the cow right away. If you’re a participant in the “420” ritual, then perceiving the cow head becomes easier… or not. i think the hatched pattern is a fence?! (behind the cow). it’s body is to the right of the pic. it’s standing side on – with it’s head twisted to its left. Took me forever to figure the last one and in the end I lost patience and had to peek at comments and cheat. I love the circle-square illusion! Whilst I liked the vampire, once seen that is all I can see now. So, from the perspective of throwing my eyes into total confusion (or my brain) I voted for the optical illusion. 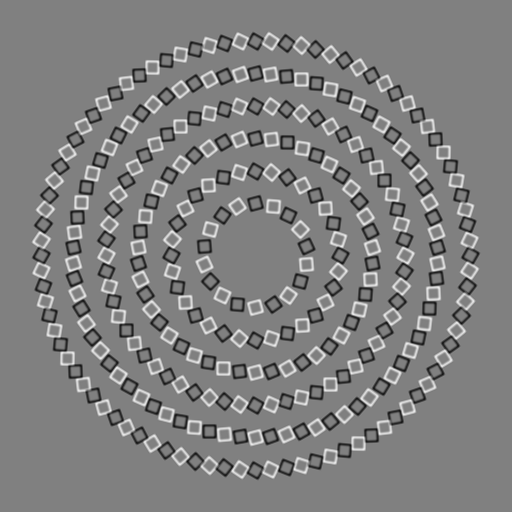 Even knowing that they are concentric circles, my brain and eyes refuse to see them that way. I don’t get the third picture. It’s blurry, grained, scratched and saturated picture. It’s also obviously a cow. What’s the deal? Just saw this post. In the “cow” picture, my husband saw a skull and I saw two cats, one in a cage. We couldn’t see the cow until we read through the comments. So, it’s not obvious to everyone. Problem with the vampire poster is that the red doesn’t look much like blood. I focussed first on the profiles then realized that the red was supposed to be blood. 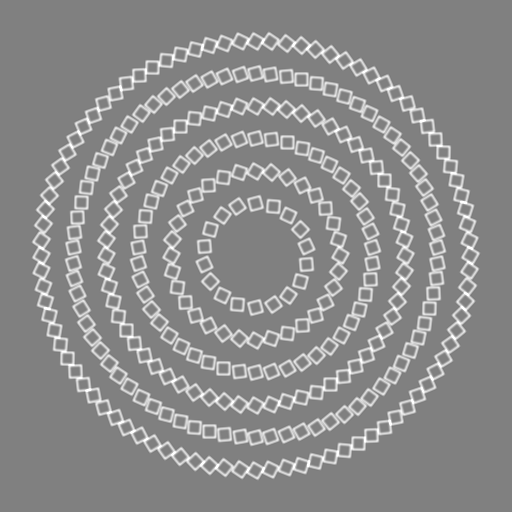 I loved the square/circle/spiral illusion so I made a PostScript version of it. 🙂 Anyone want the code to tinker with? Just figured out something interesting — if I look at the circles illusion while scrolling the page (so when it’s moving), it actually looks like circles. As soon as I stop scrolling, it looks like spirals again. Wonder how that works? I keep wondering if I’m supposed to see something other than a cow’s face in the bottom picture, because I saw her the moment I looked at the picture. It seems very clear: this is a cow. Is there something else there? All I see is the Isthmus of Panama in the bottom pic. Seriously, I don’t see anything else. For those that saw a cow in the bottom picture right away, Im curious if maybe youve seen this image before. Im no idiot and Ive seen a TON of illusions, including the similiar dalamation one.. However I saw nothing but maybe human teeth in xray (The black spots to the left of the nostrils) until someone described how the cows head was situated. I still feel a bit lied to, because those “teeth” and any blobs outside the cows head-area seem like random inkblobs added to confuse the viewer. Even once you seen the cows head, all those blobs outside the head look like… well, blobs. Perhaps the “xray teeth” im seeing to the left of the nostrils are because the cow is leaning over a barbed wire fence? Otherwise, I see nothing but confusion outside of the Inner-head image. I don’t think I’ve seen it before but I looked at the picture of the cow for a minute or so trying to figure out what else was supposed to be there before reading the comments. I saw the vampires instantly, and saw the blood puddle third. The second thing I saw was a man facing to the left made out of the ‘blood puddle’ (he has a hat on). I thought that was the illusion until I read the comments. The third image I saw a cat and a gerbil/mouse-like thing, which shifted into a feeding bird from above, and includes a lined partial image of the globe on the left, and it keeps shifting around. The cow is in there, but it seems one of the weaker images. So my winner is the illusion. I knew immediately was the illusion was, but it taxes two eyes to follow the ‘lines’. I close one eye and can follow it easily. I see a Hidden Mickey. OK, I finally see the cow; I was wondering what the hell people were babbling about. Why does the cow have a grid pattern on it? how about the bunny – anyone else see the bunny? I’ts not very realistic, more like a hand shadow but in the negative. bunny? you’ve lost me there. I see a vampire cow! Walking in a spiral! In my communication class in college, I presented the class with around 25 various illusion prints from a collection my psychology instructor maintained in the college library. Every classmate enjoyed this viewing and many said it make you realize things are not always as they appear to be. If you enjoyed these shots, you should take the time to search out others. It makes a nice hobby and sharing what you find with friends makes for great time sharing. It will make you look at the things you see around you and notice there are actually a lot of strange patterns everywhere. Good job and I hope you continue to find more views to share with everyone. These type of views are worth sharing. This particular illusion was created by Pinna and Gregory in 2002, and our lab recently did some research on it! the background color of the image actually makes a difference. The effect only appears when the background luminance is between the two colors of the squares. Awesome analysis on the illusion. Thanks! I see the vampires and the cow right away-…and look and look, and still see only that. In the vampire one, what else are we supposed to be able to see? Am I the only one for whom the boxes / circles optical illusion looks distorted? I’m only seeing the left half, stretched horizontally to fill the complete width, with alternating white lines between. It looks like that in Firefox and in IE, and even in Irfanview if I download it. But I definitely remember seeing it correctly a few days ago! I’m a designer in new york and the True Blood poster I saw in a bus shelter and for a while I couldnt understand what it was, days later came by it again and finally understood the picture, after that just like the arrow in the fedex logo I havent been able to see anything else but the revelation. The optical illusion though, thats a great one! 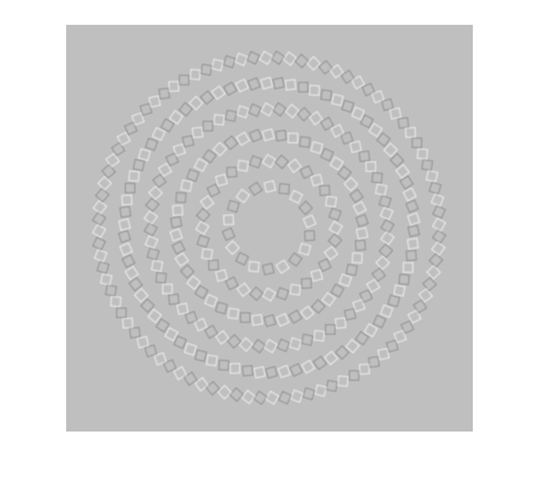 The cool thing about the circle of squares illusion is that it appears to rotate when you scroll up or down. Very Nice. It’s been a long time since I studied Geometry however I believe that the principle still exists today as it did when I was a boy and that is 1. A square is a square. It has four sides of which all are equal. 2. A circle consists of one line commencing at one point and continuing through 360 Degrees to link up with the point of origin. Which can then be divided into a. It’s Diameter and b. It’s total size being it’s circumfrence. It is impossible to link together a number of squares to create a circle. If that was the case then a circle would not be a circle. Point in case: With a “Compass” either “Magnetic” or “Gyroscopic”, both work on the principle that both regard the circle as being the “Whole” and as such, is then divided into 1. four equal 1/4s 2. each of those 1/4s are then divided by a further 4 x 1/4s then each quarter is again divided by 4 again. 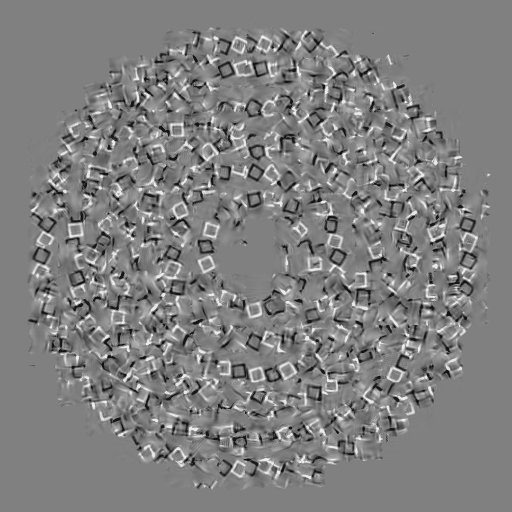 Finally the circle (Completus Maximus) is devided into (At the lowest Common Demonitor) 360 x 1Degree points. The first 4 Points are North, South, East and West. Dividing each of these by 4 one gets a division of each by 4 and they are 1. North North East 2. North East 3. East North East 4. East. ie: 22.5 Degrees of the circle at each given point. Multiply 22.5 x 16 and you should arrive with ? So if what I have attempted to extrapolate here is indeed correct then it would be impossible to group a number of squares together to form a circle. personally, i can see so many things in the last picture. however, no cow is clear to my eyes. It took me a while to see the vampire picture. It has two profiles, a face trying to bite the neck of the other.. and there is blood in between. And i can not understand the circles/ squares debate. What should/ shouldn’t I see? Does anyone know where the photo of the cow originated from? Who took it when? I don’t get the third image. could anyone tell me? Thankfulness to my father who shared with me concerning this blog, this webpage is truly amazing. However I am having difficulties with your RSS. I don’t understand the reason why I cannot subscribe to it. I know this website presents quality dependent content and extra information, is there any other website which gives such stuff in quality? bordering on rude and doesn’t seem to give a damn about anyone but himself – what exactly do women see in a guy like that.